Welcome to our 3-minute guide to Viessmann boiler problems, symptoms and fixes. Not all boiler problems are terminal, so hopefully this troubleshooting guide will help you make sense of the fault, so you can get your boiler fixed ASAP. We’d always advise getting a professional to help fix the problem with your Viessmann boiler. You can get help from boiler engineers here. Or, if you’re thinking of ditching your tired old boiler for a new and efficient boiler, visit BOXT (part owned by Bosch). You’ll get a incredible deal, a fixed price online using their form, and up to 10-years warranty! If you’ve got heating, but no hot water, there are a few potential culprits. This is a common problem with the Viessmann Vitodens 100 and Vitodens 200. Although there are various explanations, there’s a good chance that your boiler engineer is going to diagnose a faulty diverter valve. A diverter valve in your boiler helps switch between hot water and heating. If a diverter valve wasn’t fitted, your radiators would heat up every time you call the boiler for hot water. Now if your diverter valve is faulty or stuck (on the heating side), that’s why the heating works, but the hot water doesn’t. If your Viessmann boiler is particularly old, there’s a good chance your diverter valve can’t be repaired. A diverter valve costs around £350 to be replaced (depending on the boiler model). If you’ve boiler is over 10 years old, other parts could be degrading too. Have your engineer check over the most expensive parts in your boiler (burner, heat exchanger, pump and fan). If they look like they’re about to fail, it might be worth considering a boiler replacement. You can get an online price for a new one in less than two minutes here. Here are three scenarios that will help you to figure out what the problem with your Viessmann boiler is. This is the only symptom that signifies a boiler fault. It’s a sign of a temperature control, or water circulation problem. The probable cause isn’t boiler related, but instead, it’s caused by central heating sludge. Read why your radiators are only hot at the top here. Radiators that are cold at the top usually signify an air lock. The radiators need to be bled to remove this air lock. All you need is a radiator bleed key (like this one), and slowly open the valve until the hissing sound of air, is replaced by a slight dripping of water. A Gas Safe engineer will be able to check the heating pump for leaks, a seized motor, and to check it’s on the right flow setting. They’ll then be able to use a multi-meter to check the NTC thermistors electrical current and resistance. If they are faulty, they need to be replaced. If the NTC thermistors show no sign of faults, there’s a chance there’s limescale build-up around the thermistors. Limescale creates uneven temperature readings, so the NTC thermistors won’t monitor it correctly. Therefore, the signals they provide back to the circuit board are intermittent. Usually, the limescale settles near the thermistor. And, the thermistor thinks the overall water temperature is much higher than it is. This causes the boiler to shut off prematurely. A burner fault on your Viessmann boiler is going to be hard to diagnose without taking the boiler apart. And, that’s a job for a Gas Safe engineer. The most common Viessmann fault code displayed for a burner blockage is the F1 error. You’ll see this on your display panel. However, some models will display A3, B0, F1, F-E1 and F-E2. Usually, this relates to a flue gas sensor problem. The most common fix here is the check the flue sensor. Usually, this will be faulty, and need to be replaced. If you’d prefer to invest that cash into a new and reliable boiler, you can get prices from BOXT here. They’re part owned by Bosch, so their prices are extremely competitive. One boiler problem that won’t give indication of what’s wrong, is a burner lockout. The most common fault code that’s displayed is the F2. Although, older boilers (such as the Vitocrossal 200) may display errors such as the E1, E7, E8, E9, EA, EB, EC and F2 error codes. Typically, there’s a blockage somewhere. And, the easiest place to start, is going to be the central heating pump in your boiler. This circulation fault causes the burner to lockout, but it’s not usually the burner at fault. When the burner heats water, it needs the pump to circulate it. If it doesn’t the boiler can quickly overheat. A common pump problem that can cause this, is an air lock. We’ve written about boiler pump airlocks here. Now, if you have a faulty burner (rather than one that’s not got the right operational conditions to work in), they’ll be specific fault codes for that. 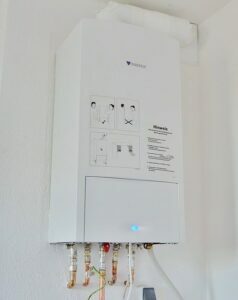 For example, the Viessmann Vitocrossal 200 will display fault codes such as the F-B7, F-F4, F-F2, F-F7, F-F8 and F-F9. The Vitodens 200 will display F10, F14, F3, and F4. The reason the boiler is locking out, is there is no flame present, no signal of a flame, or the flame is weak. An engineer will first need to check that the flame sensor is working. On some occasions, it simply needs cleaning. Next, they’ll need to check the burner itself. Hopefully, it’s clogged with debris, rather than broken. Finally, if the burner and flame sensor appear to be working, the engineer will need to test the PCB. This communicates with the sensor and burner. If it’s broken, neither will work. If you’ve got a noisy heating pump, there’s a good chance you also have cold return pipes, and your boiler will be showing a A8 fault code. Typically, this will be a heating pump that’s blocked full of dirt, or has an airlock. Luckily, both are quite easy to fix. The boiler monitors circulation of water. When it sees the minimum flow rate has not been achieved it will lock out, which is what’s happened here. The pump needs to be cleaned and inspected for damage. Assuming the pump is in working condition, the flow settings may need to be altered to give the heating system a boost of water circulation, to meet the minimum flow rate the boiler requires. If your Viessmann boiler problem relates to a unit that won’t ignite, there’s a few potential causes. Viessmann states this is a fault with the burner. If this is clogged with debris, that’s enough to cause the fault, and a F5 error code will be displayed. However, it’s more likely there’s an issue related to the air pressure sensor. First, the burner needs to be cleaned and inspected. This switch tells the boiler that air pressure is within safe operating range. If there’s a fault with the sensor, wiring, or the circuit board it communicates with, it won’t ignite. The result could mean a new sensor, repairing wiring, or replacing the PCB. If the Viessmann fault code being displayed on your boiler is not listed, you can find it on Viessmann’s website here. So, you should contact a qualified boiler engineer to help you fix the problem. You can book in an engineer here. 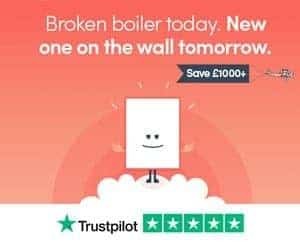 Or, get prices for a new boiler over at BOXT. Leave a comment below and we’ll get back to you as soon as possible.